BALTIMORE (CNS) — Acknowledging that families come with complications, the president of the U.S. Conference of Catholic Bishops reminded his fellow bishops Nov. 10 that their role is to accompany their family of the church through their fears and concerns. 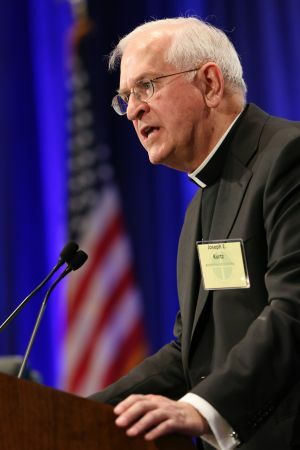 “Evangelizing means witnessing to our hope in Jesus,” said Archbishop Joseph E. Kurtz of Louisville, Kentucky, in opening the USCCB’s annual fall general assembly in Baltimore. It was his first address as conference president. Archbishop Kurtz framed his remarks around a conversation he had recently with Italian journalist Paolo Rodari, who has a brother with Down syndrome. Archbishop Kurtz for many years was responsible for the care of his late brother, who also had Down syndrome. The two discussed how they learned to communicate with their brothers through the things that were important to their siblings — film and books — and that they otherwise could be difficult to understand. The archbishop commented about some of his experiences over the last year as USCCB president — such as visiting the Philippines with Catholic Relief Services to see the relief work after Typhoon Haiyan, and the conference’s work on issues such as religious freedom and respect for life. “We all strive to be faithful pastors, so we know what this looks like,” he said. “Think of the home visits we’ve all done in parishes. When I’d come to someone’s home, I wouldn’t start by telling them how I’d rearrange their furniture. In the same way, I wouldn’t begin by giving them a list of rules to follow.